We waited nine years for this! New striping near the Steel Bridge at Naito will be done in the next few days. Safety advocates are trying to balance enthusiasm for the city’s newly announced Naito bike lanes with concern over one key detail. 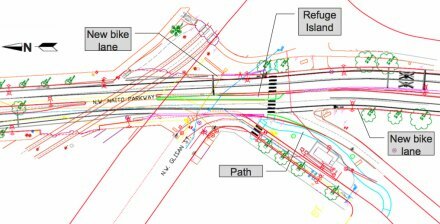 After nine years of delay, the plan to close the “Naito Gap” in the next few days drew joy from people like Reza Farhoodi, planning and transportation committee co-chair at the Pearl District Neighborhood Association and a member of the city’s Bicycle Advisory Committee. But Farhoodi said it would be a “terrible mistake” for the city not to use a right-turn arrow signal to protect bikes from right-turning autos as the bikes head north across the Steel Bridge onramp. 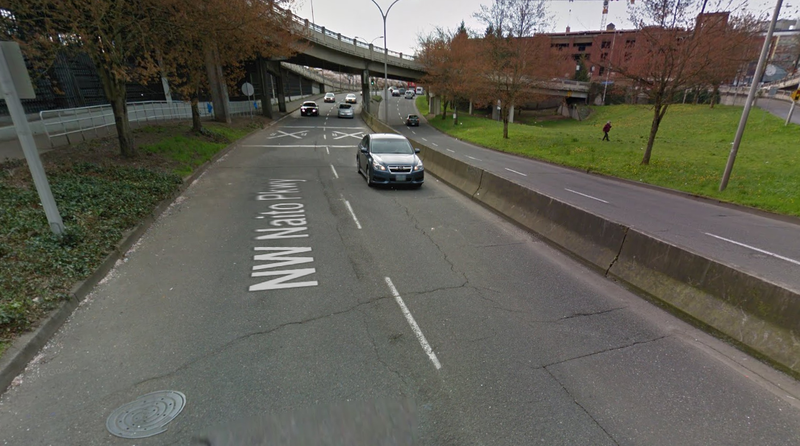 This 1,500-foot stretch of NW Naito has been a barrier to biking between downtown and northwest Portland, but it’s about to change. 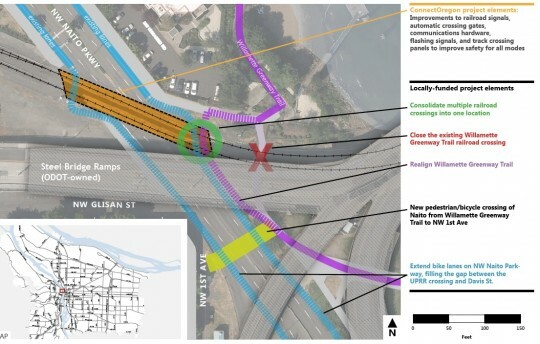 After nine years of sometimes elaborate plans to connect NW Naito Parkway’s bike lanes north and south of the Steel Bridge, the city’s transportation bureau has found a way. 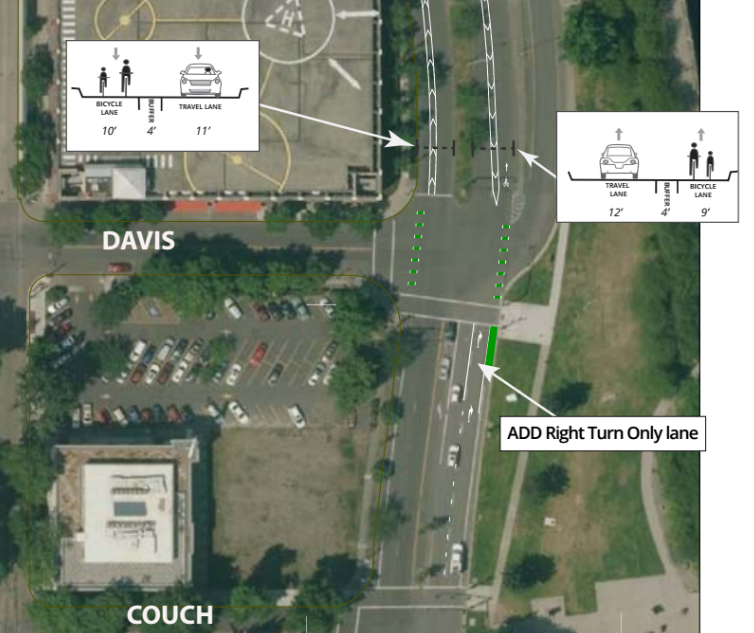 The secret: it’s removing an unnecessary passing lane in each direction between NW Davis and NW Ironside Terrace to create continuous bike lanes that will be, at their widest, 10 feet with a four-foot buffer. The existing bike lanes on Naito are outdated. Portland Mayor Charlie Hales released his final proposed budget this morning and it includes funding for a project we’ve been hoping to see materialize for several years: improved access for biking on Naito Parkway. $1.46 million to be exact. It was one of 14 infrastructure projects and over $42 million in new spending he’s put on the table. 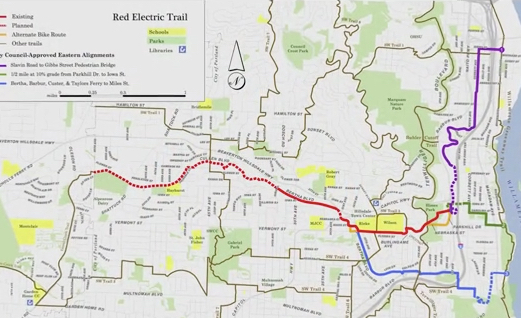 The Red Electric Trail, a dream for southwest neighborhood activists, could get over $600,000 in funding if a city grant request comes through. City Council voted 5-0 yesterday to authorize grant applications for five major bikeway projects. The $9 million in grant requests would help the Bureau of Transportation fund a host of key projects, some of which have languished on lists and in the hearts of advocates for many years. the Steel Bridge railroad tracks. 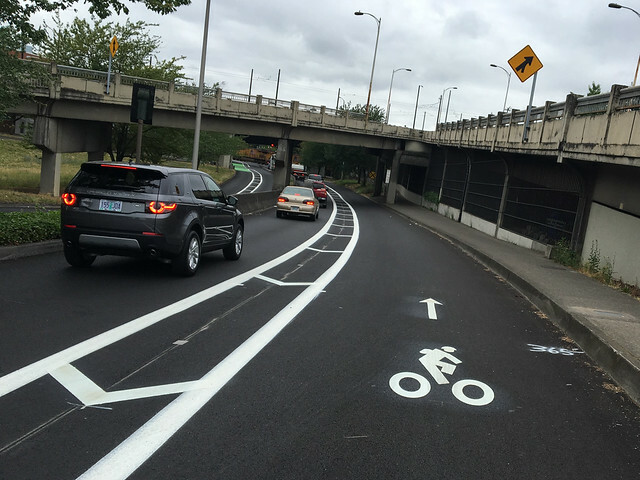 After six years of promising to fix a persistent rift in downtown’s bike lane grid, city planners have a new plan to link the bike lanes north and south of the Steel Bridge on the Naito Parkway. As you can see from the city’s tentative sketch, lots of hardware changes are required — tasks that will have to be completed by Union Pacific Railroad are marked in red — but project manager Rich Newlands tells us that the city is springing for its own analysis of the situation in order to avoid further delays from partner organizations. 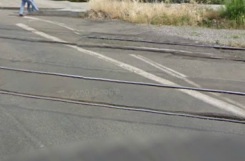 Existing tracks that cross Naito. Union Pacific Railroad (UPRR) started on a project this morning to repair their tracks on NW Naito Parkway just north of the Steel Bridge. The existing tracks have large gaps between them that make for a bumpy and jarring experience for people riding bicycles. 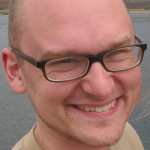 As part of my daily work here at BikePortland, I track a lot of projects. The other day, prompted by a question from reader Jessica Roberts, I began to think about all the bike projects that are currently delayed and languishing for one reason or another. Below are updates on five such projects. Each of them has been planned, discussed, and promised, but none of them have broken ground. 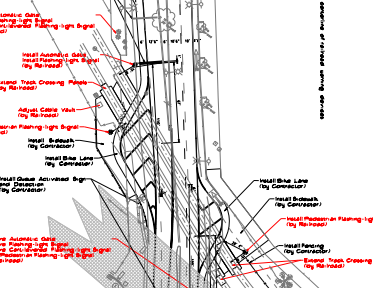 PBOT plan drawings for bike and ped improvements to NW Naito Parkway under Steel Bridge. Big changes are coming to what is currently a very unfriendly intersection for anyone that’s not in a car. 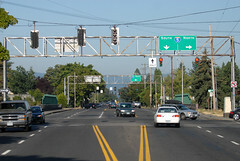 The City of Portland Bureau of Transportation recently received the final bit of funding for a $408,000 project that should drastically improve traffic safety in the area of NW Naito Parkway under the Steel Bridge.